john4jack (Corvallis, Oregon, United States) on 10 December 2009 in Documentary & Street and Portfolio. This is a path in our neighborhood that goes between streets. This is another photograph from our "Last Gasp" walk. Amazing reds! Really vibrant shot. @Stu: Thanks. I envy your time in Kyoto. Gorgeous colors !Even lady's jacket is so vivid and bright :)) Beautiful shot . @MARIANA: Thanks. That lady is my Ellie (carefully protected by Beau). @Magda: Sorry for you folks. We had a spectacular fall. 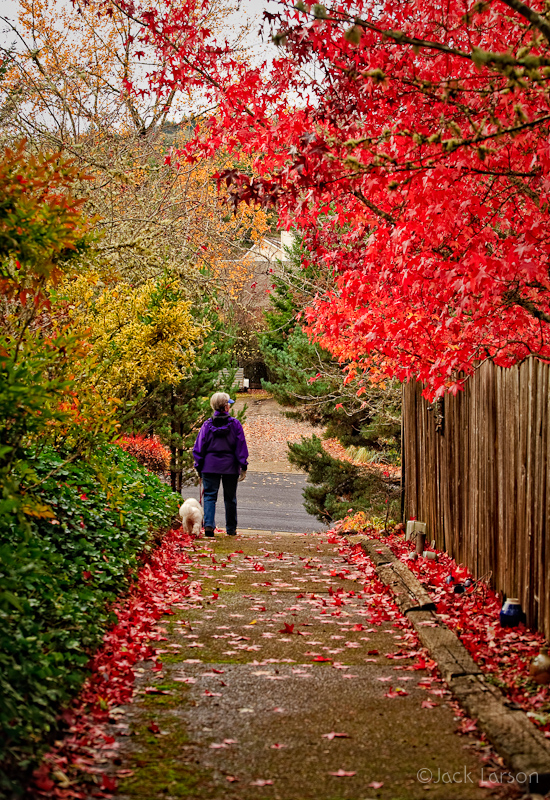 For most of my autumn photography, all I did was walk around the neighborhood. @Paco Díaz: Gracias. Come to Oregon!! The red tree is gorgeous!! It is miraculous that beauty! The maple leaves color the ground in a manner so lively! An explosion of colors! Superb! @Mathilde Collot: Merci, cher ami. What glorious colors and again, a beautiful setting. Such abundance for the eye !! @Dulcie: Thanks. Those colors are gone now. So very pretty...the colors are just wonderful Jack!! Oh so many colours of Autumn!!!! Beautiful shot Jack!!! Such a yummy path, i could eat this gorgeous red ! wow.. look at the colours.. so beautiful. Wonderful with all those fallen leaves. @akarui: And "all" of the leaves have fallen now. Gorgeous! The red colour of the leaves is quite striking - very beautiful! I like the fact that you have included somebody in this spot - it somehow adds to the mood. @Anina: Thanks. My Ellie and Beau; it was hard to get them to slow down. Extraordinary colours here..a lovely photograph all round. Symphony of colors, how light, a festival of red and gold, it's fantastic. "madame promène son chien" : c'est ce qui me vient à l'esprit en premier en regardant ta photo, ce sont les paroles d'une chanson d'un grand chanteur belge que nous avons eu en France et qui s'appelait J. Brel.
" Madam walks her dog ": it is what what comes to me to the spirit in the first one by looking at your photo, it is the lyrics of the big Belgian singer whom we had in France and who was called J. Brel. @Sylvie49 capture image! : My wife. @Fonts: Gracias. It was a fun walk. What a superb colorful perspectiv ! Great composition ! @Marie LC: Merci. Totally disappeared here, too; and in just the past week. A glorious plate of colours for my lunch Jack, now which will I tuck into first? Excellent !!!! J'aime ces couleurs fabuleuses, c'est un régal pour le regard. Très belle photo mon ami ! I like the deep red leaves on the right side. A last gasp walk worth taking. We had our hike only a week ago and now it is 2 degrees out and snow. Maybe it's time I capture the white ;) Beautiful image, Jack. @Self-Indulgence: We haven't hit 2º F, and probably won't; but we have been down to 16º F for a few nights; it's okay until a breeze comes up. Thanks for your kind words. i wish i could walk down this path -- faaabulous color! The path makes a beautiful walk way with all the color in the fallen leaves and the brilliant of the leaves remaining on the tree. I like having a person there with her dog. This adds a nice human touch. @Slackwater - don: The person is my dear wife; tough to get her to slow down. good framing and i like this red tone ,wonderful ,jack ! @marc battault: Merci, mon ami. A fantastic autumn image ! @dabbler: Thank you. Had to have that jacket!! Love this redn and the mix of colors !!! Really beautiful !!!! The colours are absolutely "WOW." @Michael Rawluk: Merci, mon ami. Wonderful capture with good depth. I like how the fallen red leaves line the walkway. The red trees are so beautiful , here it's nearly finished just some yellows ones in the little park near my flat . Great colors! The path with the leaves on it is great - leads into the frame! @Tracy: No, you certainly don't live in a shabby place. Our neighborhood is fabulous. Tons of hills. A variety of fine architecture. Lots of massive trees (both evergreens and deciduous). Our place is like a mini-retreat center. A scene of magnificent splendor. Stunning colors! That poodle is walking on the Red Carpet, magnificent! @Monique: Not bad duty!! Beau is a Bichon. Perfect tunnel you've created for this walk. So much color! A riot of lovely color. @Steve Rice: "Turn out the lights. The party's over." That reminds me of my childhood in New England. Lovely. @MontereyJohn: And now you have to suffer in Salinas!! just gorgeous color.....and like the perspective too!! @Susan: Thanks, Susan. onOne Plug-in Suite 5 is now operational. I need to spend some time learning the various plug-ins in the Suite. I use PhotoFrame and FocalPoint a lot, but not the others. @BJ: For shooting this fall, I have hardly gone out of our neighborhood. It has been a panoply of color. The purple adds so much to this shot. Wonderful capture. @B. Thomas: Thanks. Ellie's all-purpose jacket. Ellie & Beau are wonderful additions for scale in this colorful image, Jack; BRAVO. @Judy: And not only for scale!! Photo Tools in On One is my new fave!!!!! @Susan: Cool. I just need to get with it. A nice continuation on the theme. How fortunate does one have to be to live in this colourful world? This is amazing color! Great capture and I like the perspective looking down the path! Wow! What a superb shot! It says "This is Fall--get out and ENJOY it!" @Bill Laing: Bill, Thanks for all of your incredibly kind comments on my recent photographs. Great colourful perspective! I don't know where to look first....up or down?! @Monique: Beau says, "Oh Monique, you know that I love you no matter what!!" I can´t get over the brilliant red colours.The shot is also nicely framed. @Anthony Morgan Lambert: Thank you.